It's asparagus season!!! I love asparagus, and was lucky enough to get some FRESH from my friend's garden...like, I picked it myself. I was over the moon excited about my asparagus. 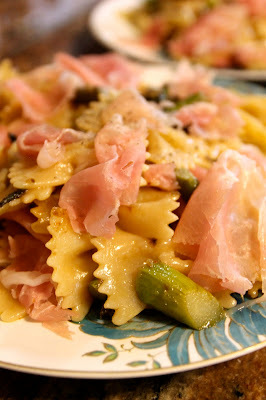 There was one thing on my mind: PASTA with ASPARAGUS! I love a good spring pasta, don't you? I made this version of spring pasta last year, so I wanted to do something a little different for you guys. This is a lighter olive oil sauce, and it got my husband's stamp of approval, so you know it's good. 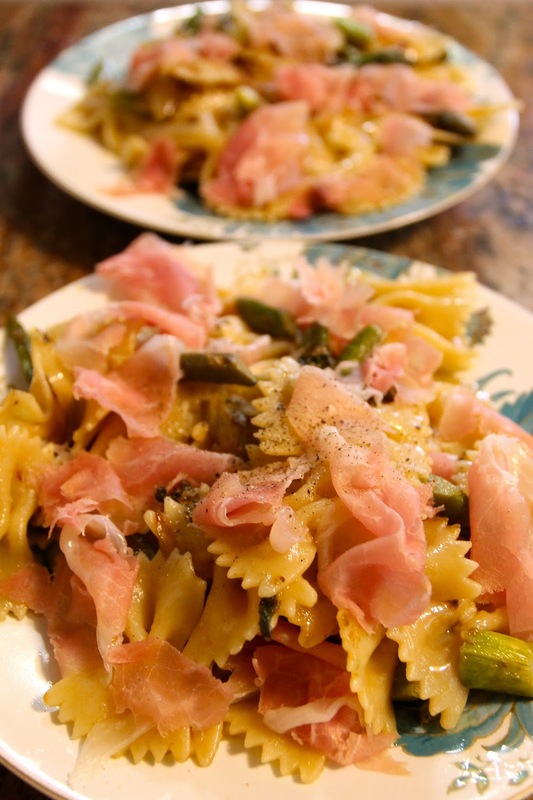 I also added some prosciutto to this recipe, which I add directly on the plate of pasta at the end. You can really use any type of pasta you want, but I went with bow-tie pasta. You know why? 'Cause I like the shape. Fun shapes taste better! Fact? Fact! In my pan I drizzled a couple tablespoons of olive oil. I have about 14 stalks of asparagus, sliced. You can use anywhere from 10-14, or heck go crazy, depending on what you have on hand! I also threw in two cloves of freshly minced garlic. I'm going to sautee all this for about 5 minutes. While that is happening, let's make some pasta. 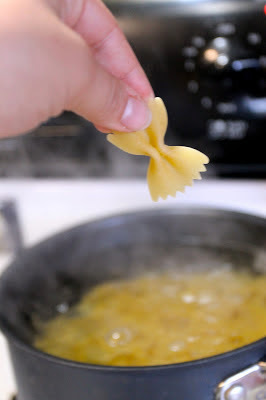 As I said, bow-tie pasta is what I used because the cute shape just turns me on! I'm using a half a pound. After your 5 minutes, add the onions to the pan and cook until the onions are becoming translucent, somewhere in the range of 3-5 minutes. When that is done, if my pasta is still cooking, I just move it off the heat, or turn the heat on very low so it doesn't overcook. Once the pasta is done, drain it, don't rinse it, and then throw it in your pan, which are going to return to the heat...medium heat should do. Toss in a fourth of a cup of parmesan cheese. The sprinkle kind. No shame in my sprinkle cheese game! I also add a few dashed of cayenne pepper....because I add a few dashes of cayenne to everything. I add some hand torn pieces of prosciutto right to the top of that dish!!! YUM, yes? I'm lucky I even got this picture because I scarfed this down. Scarfed. No talking. Just scarfing. In a skillet over medium high heat, get your oil hot. 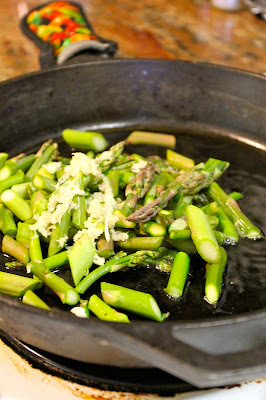 Add your asparagus and garlic, and stirring, sauté about five minutes. Meanwhile, in a medium saucepan, boil water and add your bow-tie pasta, and cook according to manufacturer's directions. When your asparagus has sautéed for the five minutes, add the onion to the pan and allow that to cook three to five minutes or until they are becoming translucent. When the pasta is done, drain but do not rinse. Add it to the vegetables, and add the parmesan cheese and cayenne pepper. Stir to combine. Dive the pasta/asparagus between two plates. 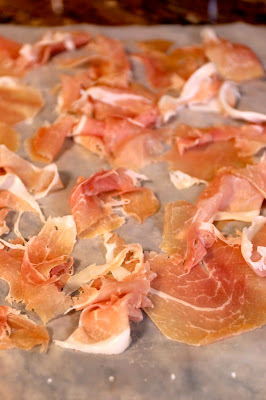 Top with the prosciutto and season with salt and pepper, if desired.